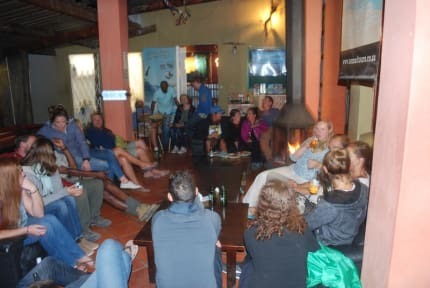 Stumble Inn is an easy going hostel with lots of upbeat energy. 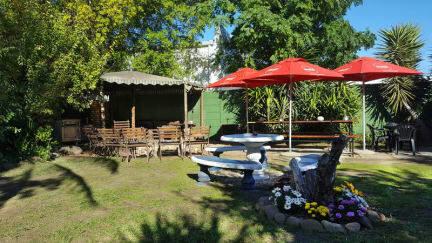 As the number one established hostel (1994) in the winelands, they ensure your stay is remarkable. With their handy little map of Stellenbosch, it's easy to discover the funky spots. The hostel has everything the traveler could need - satellite TV, great cappaccinos and friendly staff. Free Wifi. PLEASE USE UBER FOR BAZ BUS! With 17 000 students, over 80 restaurants and pubs and based in the center of the wine producing area, the recipe is fun, beauty and adventure. Lovely hostel in a cozy area. Really close to the city centre. Very clean and comfy. We had a great stay because of the exceptional staff who ensure a very friendly and positive vibe. They also want their visitors to get the most out of the local area and assist your plans.Everything in walking distance.Also if you like or need a gym or swim you can access top class facilities at the University. I have been to quite a few hostels over the years and I would recommend this without hesitation. Clean, and greatly located hostel. Wifi very weak at points, even when barely any people were using it. Nice back garden and front porch. Recommend. Very friendly staff. Location was good. There is a common area where you can meet other people. There’s also a bar where you can get cheap drinks. Good base for your stay in stelly. Dorm was cramped and warm, beds shaky so didn’t sleep that well. Other than that nice place. Staff is fun and helpful. Good vibes, met great people. They offer free drinking water and can get you on a great (but dangerous :-)) wine tour. We only stayed here for one night - not enough time to really get to know anyone or use the facilities, but our stay was fine! The staff were very friendly and even lent us a phone charger and a towel. The place is rather shabby chic and it's quite loud (our dorm room was right by the kitchen and some guests got up early to cook and were very noisy). There is space to park, a good bar and it's walking distance from good bars, restaurants etc. Also a good wine tour you can book with reception. Very basic hostel with a front desk that closes early and opens late. Location is great, but that is it. No towel rentals if you are in a shared room. They had no generator so the hostel was without power for around 6 hours per day during load shedding. No ladder to get to the top bunk bed, meaning you had to stand on the persons bed below yours to get up. The 6 person dorm room was also really loud as it was right next to the common room and bar. The wine tour I organised through them was excellent though, probably the highlight of my trip! And the woman who seemed to work there was very helpful.